ItemI-01757 - The View From The Maxwell House Hotel At Cowichan Bay. ItemI-01760 - Fernwood Farms Truck Outside Of Gladwell Motors, Vancouver Street, Victoria. ItemI-01762 - Edward Lipsett Ltd., South Side Of Bastion Square, Victoria. ItemI-01763 - "The Whistler, 7 P.M. Every Wednesday, Cjvi 900." ItemI-01998 - Fulmore Residence On Songhees Reserve, Admirals Road, Victoria. ItemI-01999 - Fulmore Residence On Songhees Reserve, Admirals Road, Victoria. ItemI-02000 - Mcgill And Orme, 1201 Douglas Street, Victoria. ItemI-02009 - Operations At United Engineering Works, Victoria. 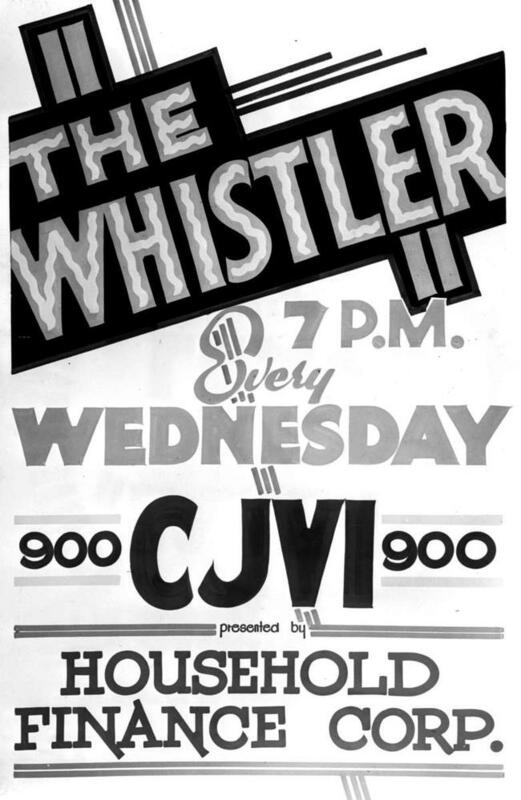 Item I-01763 - "The Whistler, 7 P.M. Every Wednesday, Cjvi 900."